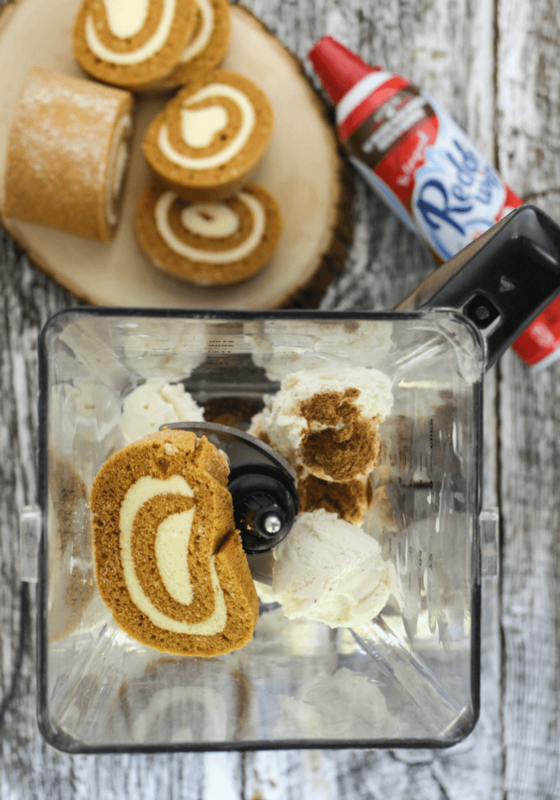 Pumpkin Roll Milkshake made with vanilla ice cream, pumpkin spice seasoning, a slice of delicious The Bakery at Walmart Pumpkin Cake Roll with Cream Cheese Filling and a dollop of cold Reddi–wip®. The time of year for pumpkin spice everything is upon us! I feel like there is an internal clock built in my body for September 1st that directly connects to my pumpkin spice cravings. Pumpkin spice everything is a must- yes, I am that person. Bring on the pumpkin recipes! While on my weekly shopping trip at Walmart, my stomach lead me to these gorgeous Pumpkin Rolls in the bakery section. 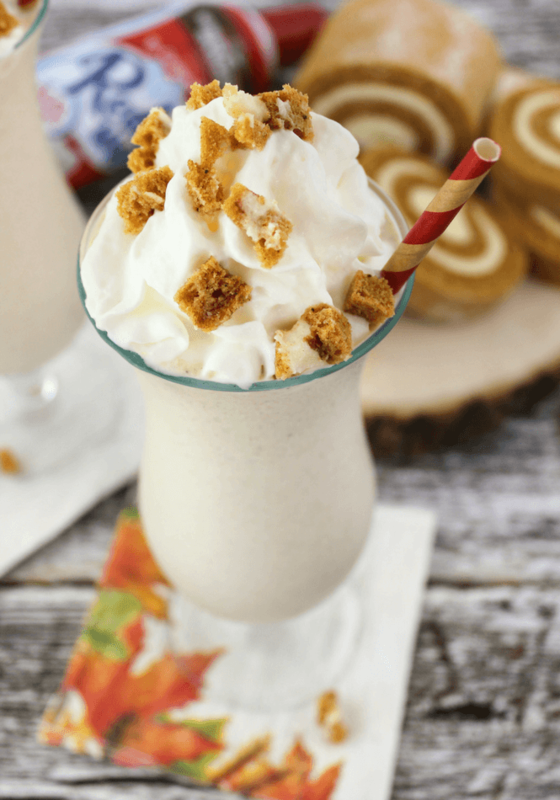 Since the weather has been in the upper 80’s here in Cincinnati so far this Fall, I decided to make my family a really fun treat of Pumpkin Roll Milkshakes. 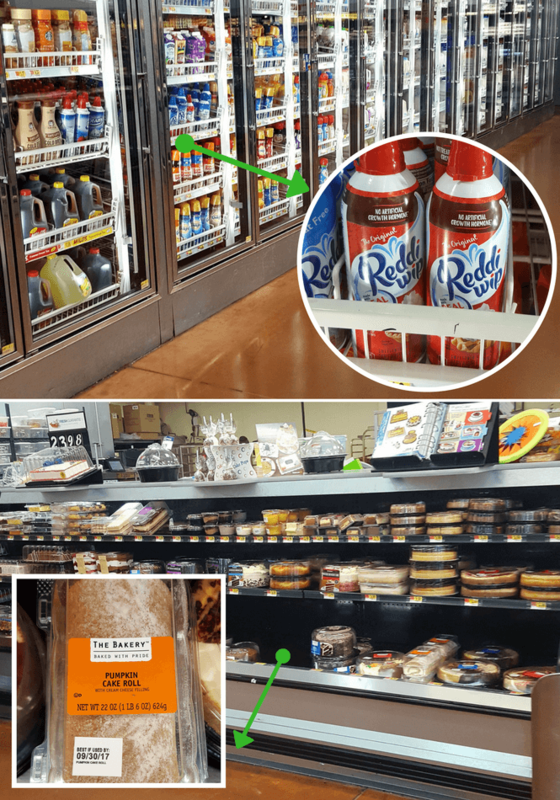 I made sure to grab some cold Reddi–wip from the Diary section to complete our delicious milkshake creation. 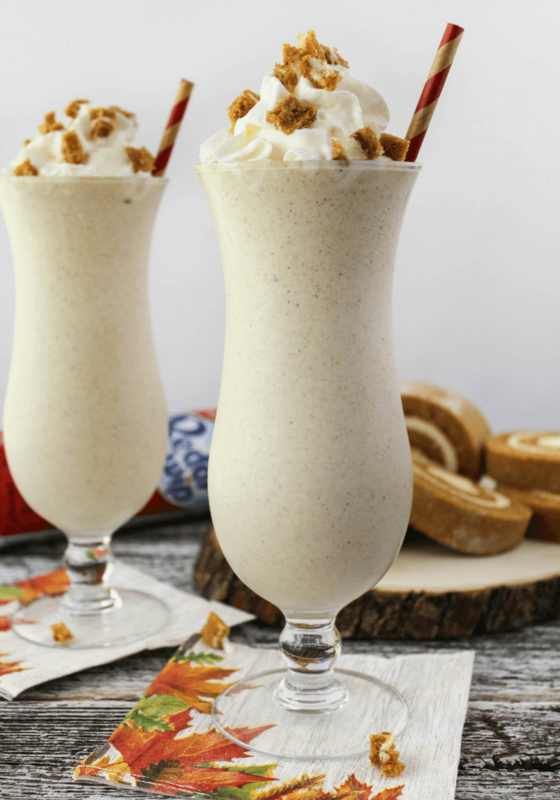 Let’s make these Pumpkin Roll Milkshakes! A blender and a few ingredients is all it takes to whip up this yummy Fall treat. Grab a blender and ingredients from recipe card. 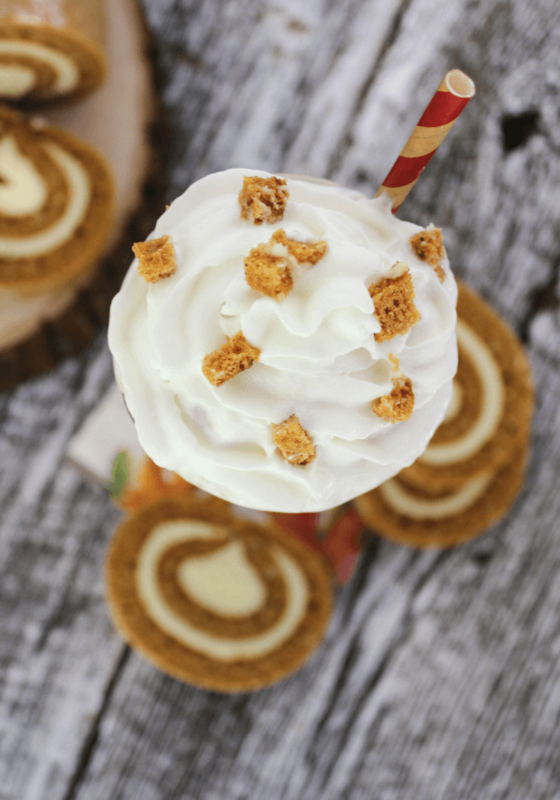 Slice the Pumpkin Roll because it is going inside the milkshake! Place vanilla ice cream, two slices of Pumpkin Roll, milk and some pumpkin spice for extra flavor into the blender. Blend until smooth. Pour the milkshake into two glasses (you could make four small milkshakes instead). 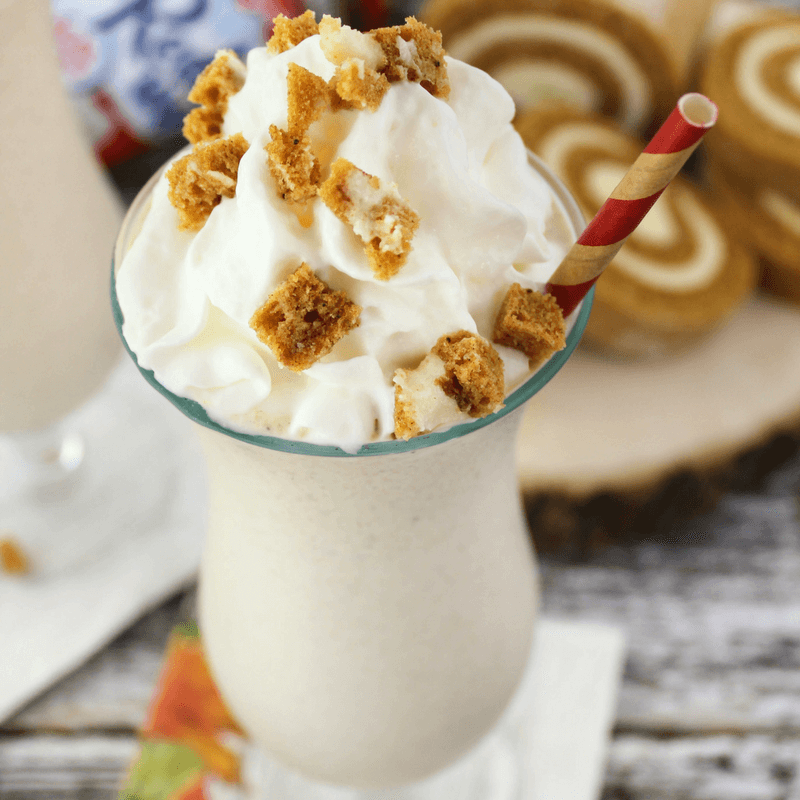 Place a straw in each Pumpkin Roll Milkshake and put a dollop of Reddi-wip on each milkshake. 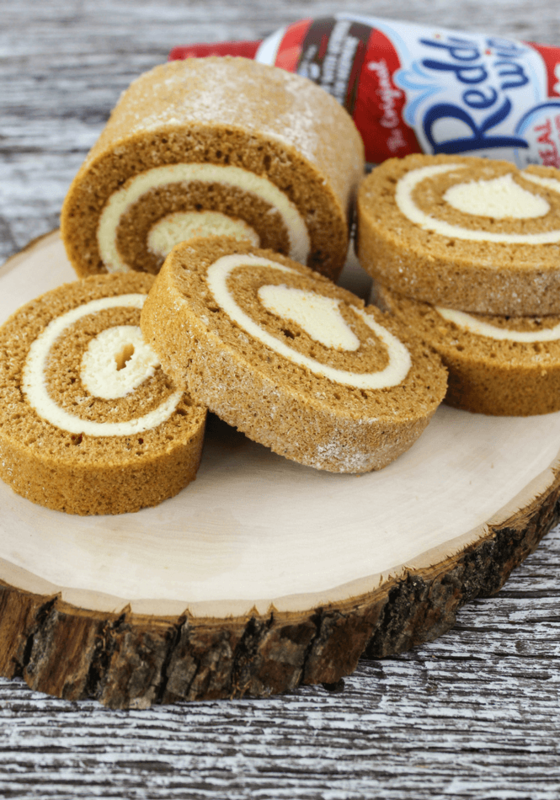 You can also dice up another slice of Pumpkin Roll to garnish on top for extra yum. Now, sit back and enjoy the best flavor of Fall! 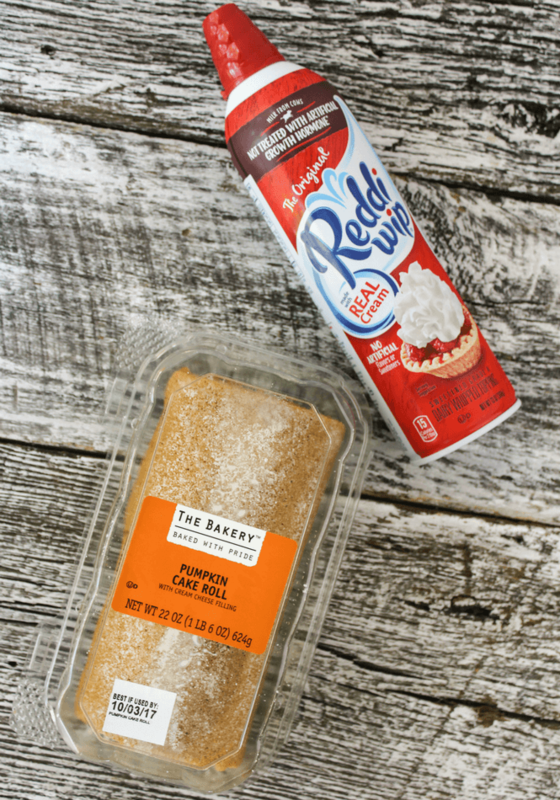 Pumpkin Roll Milkshake made with vanilla ice cream, pumpkin spice seasoning, a slice of delicious The Bakery at Walmart Pumpkin Cake Roll with Cream Cheese Filling and a dollop of cold Reddi-wip®. Cut 3 slices from the pumpkin roll. Dice one slice for garnish. Place 3 cups vanilla ice cream, .5 teaspoon pumpkin spice, .5 cup milk and 2 slices of 2 slices of pumpkin roll into blender. Blend until all mixed. If you want a thinner shake, add a bit more milk. Pour milkshake into some fun glasses like the Hurricane glasses we used. Get the Reddi-wip from the fridge and spray a dollop on top. Garnish with diced pumpkin roll and serve. Grab more “Pumpkin Spice and Reddi-wip Nice” recipes HERE and get ready for Fall! All pumpkin. All the time! This milkshake looks incredible. What is not to love? I am a big pumpkin fan too. Can’t lose. This looks so amazing!! Yum! Perfect for FAll! Omg this looks amazing!! Gets me SO excited for the holiday’s!!!! Thanks Ruthie! I can’t believe the holidays are here! Yummm! This milkshake looks absolutely incredible! I love the idea if using cake in a milkshake. I bet it makes it nice and thick. Absolutely! I love my milkshakes thick and packed full of flavor.